National Health Mission Programme (NHM), Bhavnagar has published a Advertisement for below mentioned Posts 2016. Other details like age limit, educational qualification, selection process, application fee and how to apply are given below. Educational Qualification : Commerce Graduate from recognized university (Account) and Diploma certificate in computer course , Computer software and Basic Hardware (Knowledge of Accounting Software , M.S.Office, GIS Software and Office work, Filing system, and Typing knowledge ofGujarati and English and having knowledge of Data Typing. Salary : Rs.6000/- Fix per month. 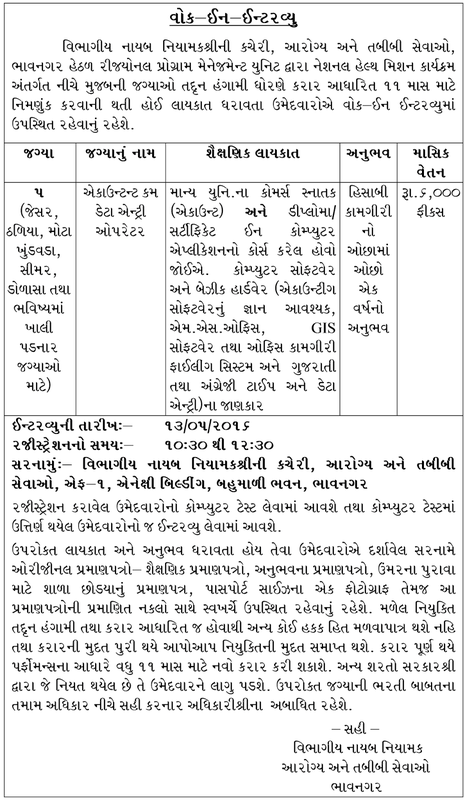 Venue : Departmental Deputy Officer's Office, Health & Medical Services, F-1, Annex Building, Bahumali Bhavan, Bhavnagar.